Tropical Storm Harvey is continuing to gain strength in the Gulf of Mexico, and meteorologists are now expecting this weather system to assume hurricane status by Friday. Texans are now battening down the hatches in preparation for high winds, extreme rains, and an unusually high risk of flooding. Winds within Harvey are currently blowing around 60 miles per hour (94 km/h), but they’re expected to increase. Additional strengthening is forecast during the next 48 hours, and Harvey is expected to graduate to a Category 1 hurricane by Friday, according to the NHC. Should it become a hurricane, it’ll be the first to directly hit the Texan coastline since Hurricane Ike in 2008. Atmospheric scientist Ryan Maue is worried that current conditions in the Gulf will push Harvey far beyond a Category 1, speculating that it could reach Cat 3 or even Cat 4 status in short order. The leading edge of the storm should make landfall by tomorrow evening, hitting close to Corpus Christi. 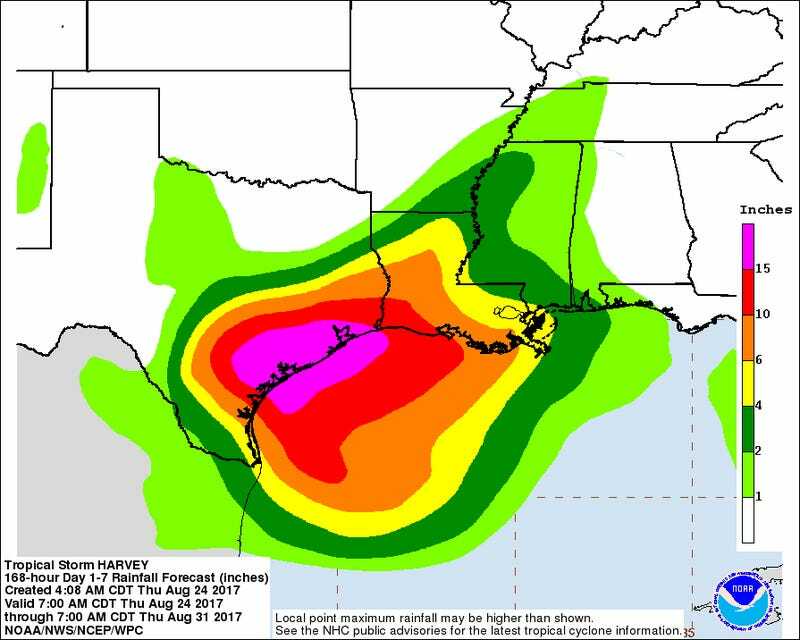 At that point, Harvey is expected to stall over the state, which is not good. Its slow, lumbering movements will only serve to extend the amount of time it can dump rain on the state. 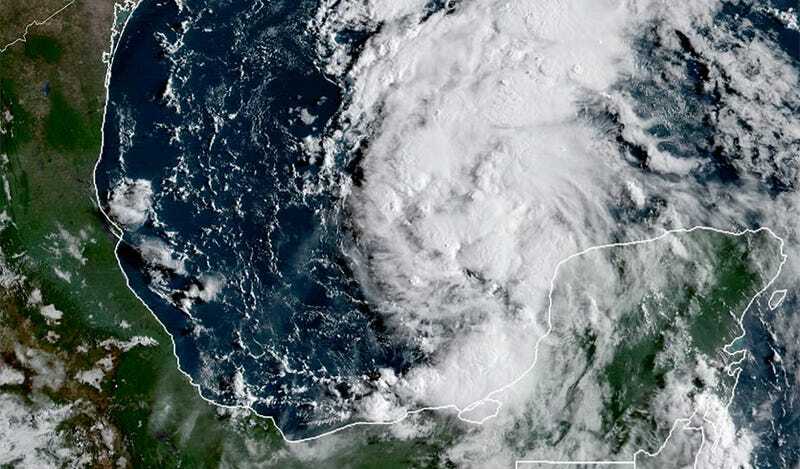 “Heavy rainfall is likely to spread across portions of eastern Texas, Louisiana, and the lower Mississippi Valley from Friday through early next week and could cause life-threatening flooding,” noted the NHC. Total expected rain accumulations over the next several days could reach as high as 10 to 15 inches in the hardest-hit regions, with some isolated maximums reaching as high as 25 inches. Storm surge warnings, where there is danger of life-threatening inundation from rising waters along the coastline, have been declared in Port Mansfield, Luis Pass, Matagorda, High Island, and the Mouth of the Rio Grande. Many other areas along the coast have been told to be on the lookout for storm surges. The unlucky combination of a storm surge plus a high tide could produce dangerous flooding, with waters pouring into inland areas that are normally dry. Areas between Port Mansfield and San Luis Pass could see surges as high as five to seven feet, and areas between San Luis Pass to High Island as high as two to four feet. 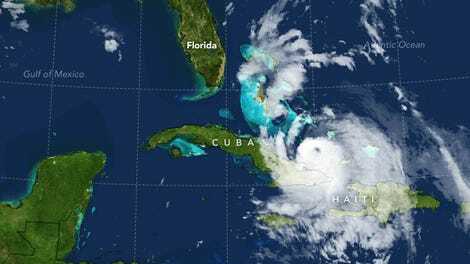 If you live in the areas affected, please stay tuned to your local weather forecast and take all the necessary precautions. Update: 4:07 pm ET: As feared, Harvey officially became a hurricane at 1:00 pm ET. In related news, mandatory evacuation orders have been issued for Aransas Pass, coastal communities along the Gulf side of the Intercoastal Waterway in Brazoria County, and Calhoun County. Voluntary evacuation orders have been declared in parts of Bolivar Peninsula, Brazoria County, and Galveston’s West End.